Charley's monkey party was a huge success and I can't wait to share the pictures with you next week. I've got some really exciting things coming up for Paiges of Style. When I was mapping out the dessert table for Charley's party, I wanted something original and handmade to adorn the cupcakes. I was inspired by this fabric flower garland over on Once Wed but made a couple of tweaks to turn it into a cupcake topper. 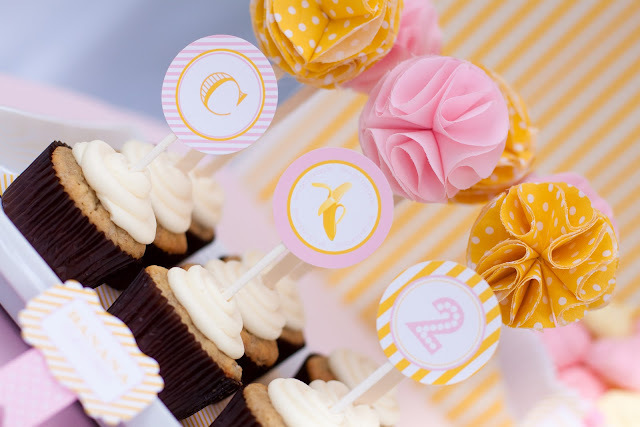 I think these might just be the newest trend in cupcake toppers. 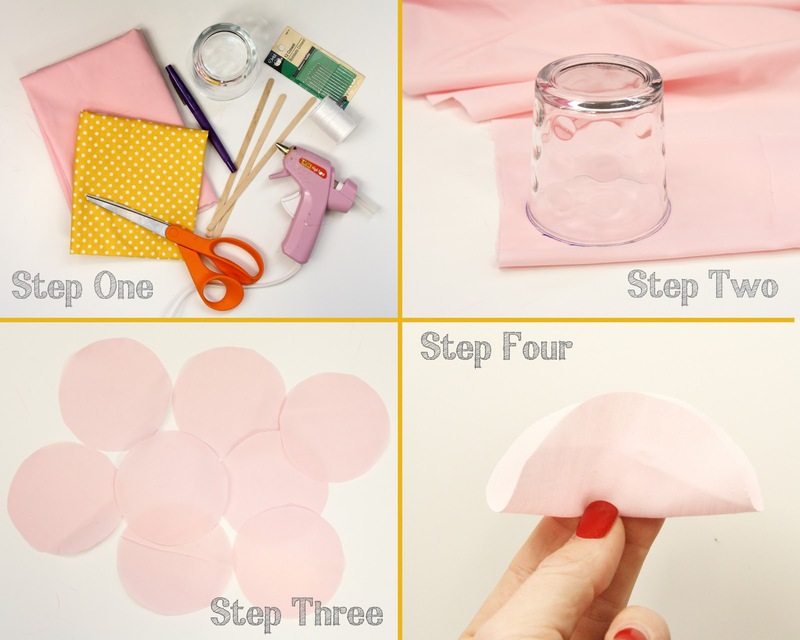 Get your glue gun out and get your craft on, these are so fun and easy to make. Step One- Gather your supplies. You will need fabric, scissors, a pen or pencil, needle, thread, glue gun, a circle to trace and a lollipop stick or wooden coffee stir stick. Step Two- Trace your circles. I used a circle that was 2.5 inches diameter to trace mine. You need 16 total per cupcake topper but you only use 8 at a time. Step Three- Cut out your circles making sure to cut off all pen marks. Step Four- Fold your first circle in half. Step Five- Fold in half again. 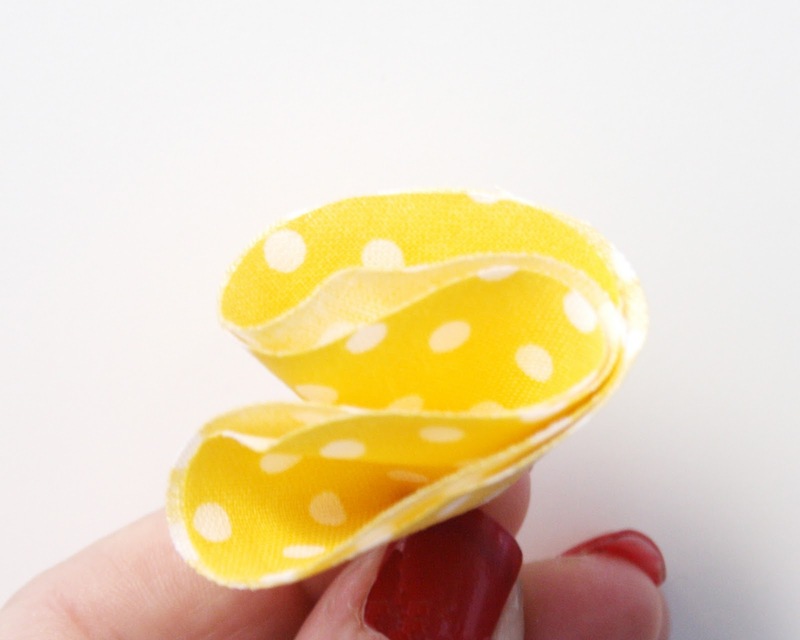 Using your threaded needle, stitch the needle into the corner of your folded circle. Step Six- Repeat with remaining 7 circles so that there are a total of 8 folded circles threaded onto your needle. Step Seven- Pull your thread all the way through so the knotted end of the thread is tight against your bottom circle. Step Eight- Take your needle back through the first folded circle like pictured above to complete the flower. Step Nine- Pull your thread as tight you can and watch your flower come to life. Tie a couple of knots to secure the flower in place. The back of the flower is pictured in this step. Step Ten- Admire your cute little flower. Then repeat steps 1 through 9 so you have two of these. Step Eleven- You should have two flowers by now. 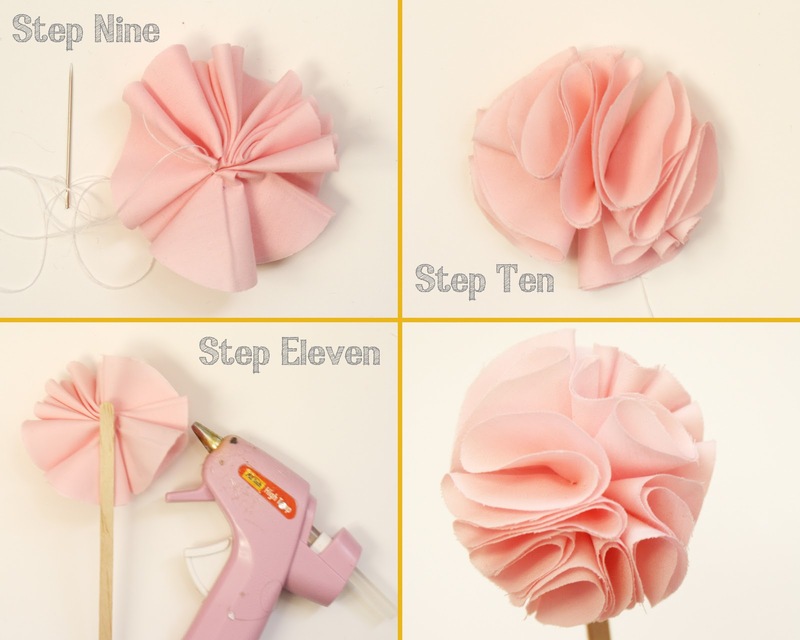 Use hot glue and sandwich the stir stick or lollipop stick in between the flat sides of each flower. If you plan to make these with patterned fabric, the instructions are slightly different. For each half flower, cut out 10 circles. 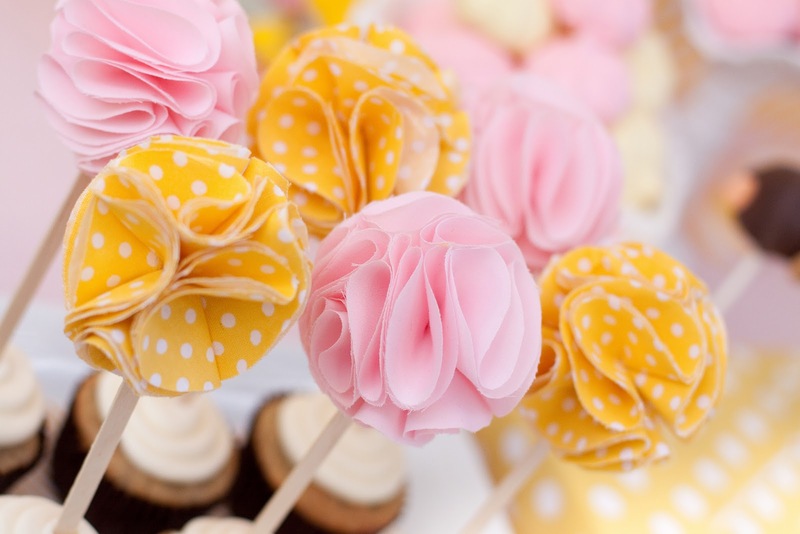 You should have 20 circles total per cupcake topper using patterned fabric. Pair up two circles with the wrong sides facing each other (so the pattern shows on both the top and bottom of the pair of circles) and then fold in half and in half again. Doing this step ensures that you have the right side of the fabric showing as much as possible. Thread onto needle as pictured in step five above. 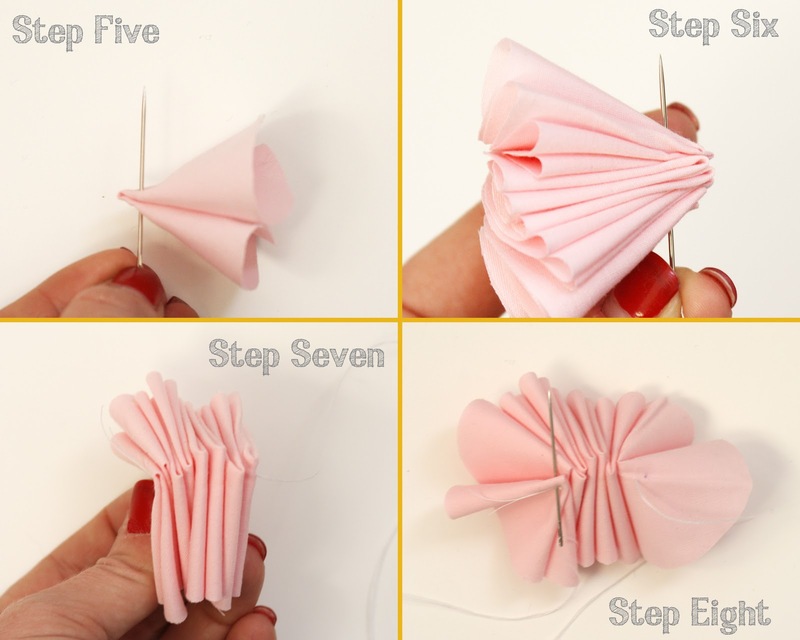 Continue the pairing of wrong sides together and threading onto needle until you have all 5 pairs on the needle and continue steps 6-11 until you have a completed flower cupcake topper. Repeat all of the same steps so you have two half flowers and glue a stick between the two halves. Love this! Will you stop posting great things... I'm overwhelmed with all the options you have to use for the upcoming shower!!! Ok seriously??!! Too cute! Can NOT wait to see the rest of the images! thanks for sharing the how to!!! and...love the manicure. Lovely idea, perhaps needs quite a bit time to make. Yours look perfectly aligned. Look forward to seeing more of what you do. WOW! Love these! This party is quite honestly the cutest thing I've seen in forever! Thanks so much for sharing; I totally agree, these are definitely a fabulous NEW idea for toppers! Thank you! will definitely try these for the next baby shower I host! 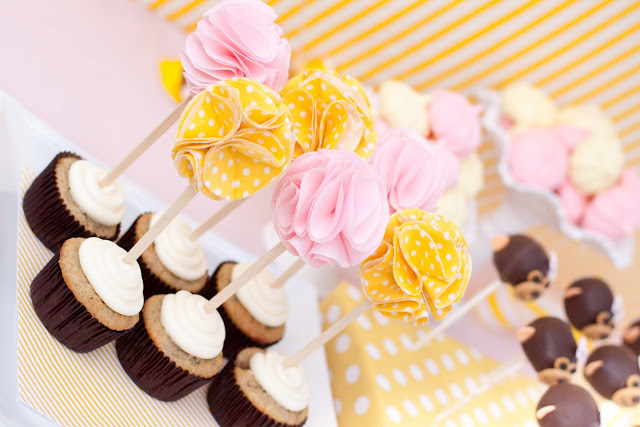 I am going to keep this in mind for a party - they are so cute! Thanks for the step by step! I can't wait to try this out! Thanks! I just discover your blog and I love this idea! If you're OK, I feature it over my french blog (www.so-lovely-moments.blogspot.com). Thanks! Oh, how very cute....and different!!!! Thanks so much for sharing!! Now off to look at your beautiful blog! These are adorable! I made one but the fabric is fraying at the ends. What do you suggest to prevent this from happening? Hmmm, I haven't faced this problem yet as mine haven't frayed. You could either cut them out with pinking shears in the future or head to your fabric store for some spray that stops fraying. Good luck! Hi! I have to say your monkey party was just FABULOUS!! Thank you for sharing!! Also- thanks for the tutorial on the fabric toppers! I totally made them (as ornaments) for a centerpiece for a dessert table! (I made sure to let people know where I got the idea and sent them to your DIY post! :-) Thanks, again! Hi there. How thick should the fabric be? Definitely making these! Hi Paige. 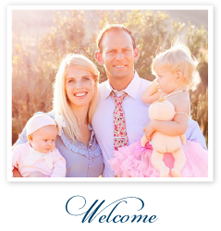 I love your new blog design - beautiful! Those are so cute and pretty! How adorable are these??? Thanks so much for sharing! !